The award-winning Lottie range is a a new way of thinking when it comes to the dolls our children play with. Instead of the size and shape of a fully grown woman, Lottie dolls are designed based on the average proportions of a nine year old girl, giving children a far more realistic and healthier perspective when it comes to body image. 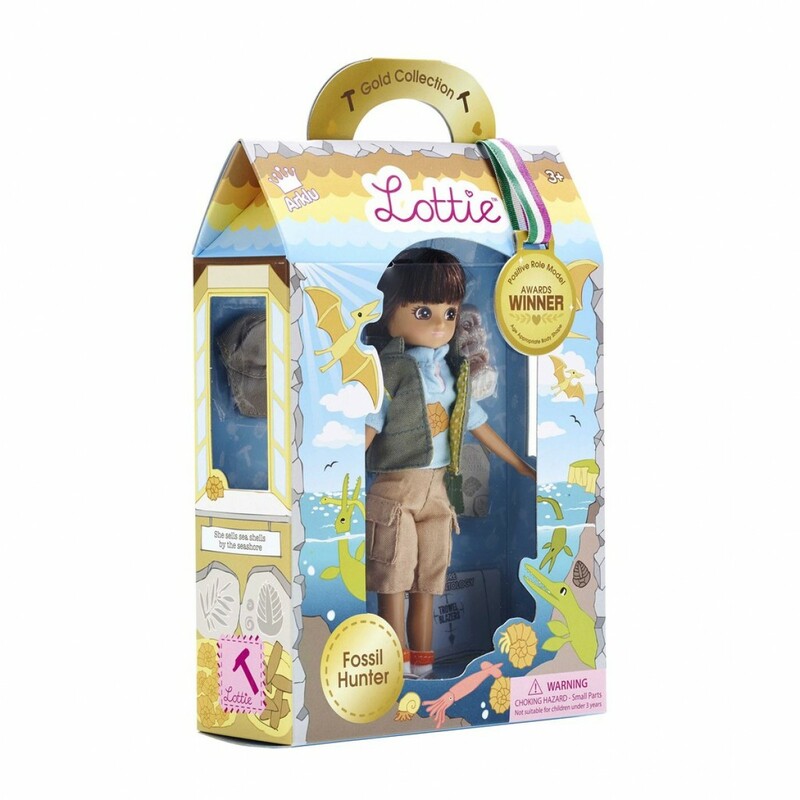 The Special Edition ‘Gold Collection’ ‘Fossil Hunter’ Lottie doll is a collaboration with TrowelBlazers, an Anglo-American group of women archaeologists, palaeontologists and geologists. With her special rock hammer and backpack full of useful gear, Lottie is ready for an adventure at the cliffs by the sea. It is so exciting to think that she might make her own scientific discovery! What will she find? An ammonite? A bone from a plesiosaur? Or maybe even a dinosaur…! Lottie dolls are designed to represent a healthy view on body image and lifestyle, so not only is it easy for little ones to relate to her, she is also a great role model! Lottie dolls all enjoy diverse activities designed to encourage active play, so they also provide positive reinforcement of the importance of an active lifestyle. Lottie's clothing is made up of tactile fabrics with lots of attention to detail, which allows your little one to easily dress and undress her, with easy open Velcro fastenings.